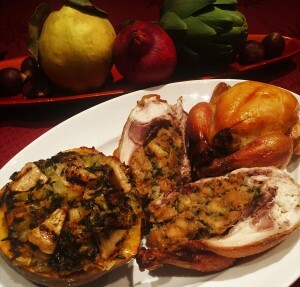 Cornish Game Hen with Natural ArtiHeart Bread Stuffing and Acorn Squash with Grilled ArtiHeart Brown Rice Stuffing. Serves 10 or stuffs a 10 to 15 pound turkey. The night before or up to 2 days before, spread the bread cubes on a sheet pan and place them in a warm, dry place. When ready to make the stuffing place them in a large mixing bowl. Heat the butter in a skillet. Sauté the onions and celery until translucent, about 10 minutes. Add the thyme and sage, stir to release their aroma, about 2 minutes. Add the white wine to deglaze the skillet and allow the liquid to reduce by half. Now add Natural ArtiHearts and the olive oi,l sauté until well combined and pour over the bread cubes. Heat the chicken stock in the pan you sautéed the celery mixture in and pour it over the bread cubes, mixing as you add the liquid. Add the chopped parsley, egg and the salt & pepper. Mix thoroughly. Spread it in a shallow buttered baking dish, cover, and bake 30 minutes at 350ᵒF. Remove the cover and bake 15 minutes longer to crisp the top. If stuffing the turkey, fill the cavity and roast until the interior temperature of the center of the stuffing reaches 165ᵒF or higher.